For any buyer, writing an offer on a West Knoxville home can be a nerve-wracking thing. Whether you’re a first-time buyer or a fourth, there’s still that part of you that worries after writing an offer. 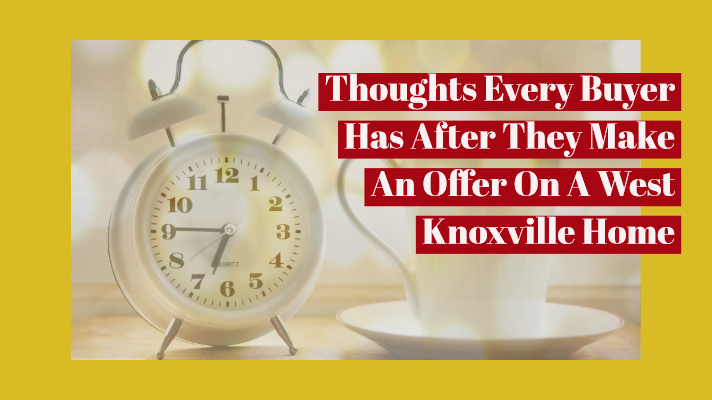 In this post, we’ll cover thoughts every buyer has after they make an offer on a West Knoxville home as well as some ways to ease the stress. What Does The Seller Think? Sellers can be hard people to predict as they all have different needs. Some want to wait for the right offer. Some want to close as quickly as possible. When you write and offer, it can be hard to guess what a seller is looking for. Is it all about price? Or, are there different things that can help sway the seller like earnest money or close date? The cleaner the offer, the more likely a seller is to accept it. Sellers just want to get to closing with as little problem as possible. Should I Have Gone Higher Or Lower? Writing an offer is a bit like the price is right. You won’t ever truly know what the correct answer is until the seller responds to your offer. They could either counter, accept, or move on to another offer completely. This always leaves buyers wondering what they should have done about price. Did you write too low and risk missing out? Or, did you end up writing too high and paying more for a house than you should? It can be a hard thing to wrestle with since you risk either missing out or paying more than you wanted to. Waiting for an offer to be accepted can be a worrisome experience. You never know how long you’re going to have to wait and what the answer will be. Whenever you write an offer. There’s always a time where the offer expires. Depending of the scenario, it could be a day or two before the offer expires. Regardless, it can be hard to wait for the news. Will the seller accept? Will they reject your offer? Or, will they counter back? Not knowing what will happen can be stressful. Before you start climbing the walls, just know the situation is out of your hands at that point. The only thing that you can control is what is in your offer. So, before you submit your offer, just be sure that it’s an offer that you feel confident about. Are you thinking about buying a West Knoxville this year? Please let us know if there is anyway that Knoxville Home Team can assist you. Rick can be reached at 865-696-9002 or via email at Rick@KnoxvilleHomeTeam.Com. Kati can be reached at Kati@KnoxvilleHomeTeam.Com. Also, be sure to check out our West Knoxville Home Search Page.